back having a drink when I asked him for a favor, please sign the cymbal. will always be a tribute to the one and only Buddy Rich. never introduced the band members to the audience that night. came down from the stage and sat in the back of the hall with his wife. audience started snickering, he yelled out and said,"Hey look, it's Mr. Humble!!" and had me stand up. Then he said,"I'll be with you in a minute." clouds away, and played a two-hour show, never missing a beat. This story and picture was sent byVinny Ozborne Jr. It was a cold, wet & windy Irish night in Dublin City. I was 16 years of age & on my way to see my 1st Buddy Rich Concert at Dublin's National Concert Hall. My Dad worked nights back then so he drove me to the gig on his way to work which meant that I was at the venue from around 6:45pm. As I stood outside the venue trying my best to dodge the weather, I saw a Black Limo pull up & drive through the front gate & sitting in the back seat waving at me was Buddy Rich. I froze with the excitement. You see this was just 4 weeks after Buddy had undergone his "Quadruple Bypass Heart Surgery" I could not believe that I was so close to the man. At eight o'clock the show started with an explosive Buddy behind the kit, some people find it hard to walk after an operation like that & here was this man in his sixties playing stuff that was humanly impossible. I will always remember Buddy's opening remarks to the audience... "It's Good to See You, it's good to see anyone." The capacity audience was treated to mind boggling drumming, music, wit & charm. The show finished & on my way out I noticed people were queuing at a door, I asked what for & was told that Buddy was signing autographs, so of course I joined the queue. About 15 minutes or so later, just as it was my turn to walk through the door, I heard a voice shout... "Unfortunately Mr. Rich has stopped." I could not believe it. In a desperate panic I ran out the front door & down the side passage that I had seen Buddy's limo drive down on his arrival. When I arrived at the Stage Door I froze & hid behind a wall waiting for Buddy to get into his limo. As he did he was talking to some people & all I remember hearing him say was "Maybe We can meet for dinner tomorrow." With that I made a battle charge straight to him with my show programme in hand, screaming "Please Mr. Rich could I have your autograph." Buddy smiled & looked at me & said... "Sure Kid, but lets go back inside, it's freezing out here." So there I was standing side by side with God himself, I was physically shaking. Buddy signed my programme & I asked for a photo with him, nothing was a problem. When I took the camera out of my pocket I dropped it, because I was shaking so much. He had someone take two shots, just in case the first one did not come out & because I may of damaged my camera. He gave me a hug & shook my hand, I will always remember his departing comment to me... "Relax Kid, don't be so nervous, you'll give yourself a heart attack, trust me I know!" And that was the way I spent Tuesday, April 5th 1983.
sure I can fully comprehend, but then no one else can either. waiter if I would be able to remain at that table when the band started. right onto my table. He was so fast, I could not believe it! his heart attack, and once at a high school somewhere in Northern Illinois. skyscraper, and he signed it right across the Bass Drum. ever was running the spotlight, as it was being shined right in his eyes. I was first made aware of BR's technical prowess as a high school freshman. Krupa) album. So I thought "Yeah .That's what I want to do". would stop in when he came to town. and was awarded the title of "Best Young Drummer in Chicago." I was ready! day, about 8:00 a.m. I saw a black Jaguar XKE covertable, pull into the lot. Tonight Show, It was the first time I had seen Buddy play. I was "impressed"
gotten a laugh out of it. understanding that all I can ever do is pay tribute to "The One and Only". And so I do. Thanks Buddy. Story sent by John H. Brinck, Jr. .....I would like to remember the "greats" as being just that.....but I do have a bad cassette recording, recorded on a tour bus, as Buddy and one of his "college" bands are heading for L.A......and Buddy is in rare form with four, five, and ten letter expletives because the band, that particular evening, and especially one of the trumpet players, was not "on". On the tape you can hear the trumpeter challenge Buddy's opinion of his playing, and the next thing you hear is Buddy yelling to "pull the bus over, and let this m....f...off; and then yelling the fact that the whole band was going to be replaced by "mature" musicians once they reached L.A., etc...etc...I, however, will not release this tape to anyone. It demeans Mr. Rich, as it shows his "Hydish" self. I, however, will remember the suave gentleman I met, listened to a few inches away from, shook hands with, and generally "percussively" studied that one evening in Waikiki. didn't understand me) and still do today. Thankfully they (whoever "they"
all are) seem to be re-releasing most of Buddy's recordings on CD. in the corner. Tables, big and small were crammed in the place. teacher walked up to the host and shook his hand, something I found strange. glossy 8x10 signed To Alan, Best Wishes Buddy Rich. of my fondest memories of any time in my life. I started playing drums when I was in seventh grade. As a kid, I had no idea who had been the driving influence behind drums and drumming, and only had the popular music on the radio to listen to and imitate. Like most kids, I dreamed of playing professionally and making it big. It became only natural to check out other drummers. After I looked at the many different drummers in various local bands and listen to every rock drummer I could find on the radio and record album, I happened to see a Gene Krupa album at the store. I bought and listened it an was truly inspired. I didn't think drums could sound like that. One night, the Gene Krupa Story came on the late late show and I stayed up on a school night to watch it. There was a real master. Krupa himself played the sound track and Sal Minio captured the style of Gene in a performance that was a bit hokey by today's standards but still inspiring in its musical content. The more I looked into that "Scary Krupa Drumming" the more another name kept popping up. Who was this Buddy Rich guy? In the late sixties I caught him one night on the Tonight Show. I was awe inspired. I bought as many Buddy Rich albums as I could find. This seemed quite odd to my musician friends and nobody at school seemed to know who he was. They were buying rock albums and I was buying anything with Buddy playing. 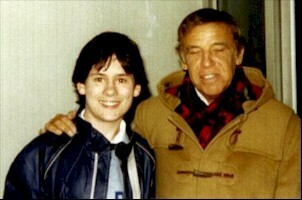 By the middle of my high school years, almost all the band students knew who Buddy Rich was. They watch the tonight show with regularity. Buddy's frequent appearance and the tonight show band, offered a style of music that was new to us and fading from the scene almost as fast as we were discovering it. Buddy Rich had one of the only big bands using musicians near our age. We knew that at least a couple members from the one o'clock stage band at the University of Texas had played with him. There was all kinds of enthusiasm for starting up a big band in high school. I remember playing an arrangement of Mercy Mercy with eighteen of us at the high school talent show. Buddy Rich had an underground following of what would have normally been rock fans, listening and buying his Big Band Jazz albums. Because of his influence, we bought other Jazz albums and learned who some of the truly Jazz greats were. We would not have otherwise been interested. One man influenced a generation younger than him in a way he may not have even been aware of. I first heard him live at the La Bastille Club in downtown Houston. I think this was 1973 or so. I had a friend who knew the manager so we got there real early. The club was closed but the band was there and we asked if we could come in early. Since my friend knew the manager he told us to sit at the bar like we belonged there and we could watch the band rehearse. I now understand that this was a rare occasion as I am told they played so much they did not rehearse much. I watch as Buddy came in, sat down behind the drums and called out three numbers. There was a sound check, several musicians tuned up and Buddy adjusted his set. It needed very little adjustment. He rolled up his pants to almost his knee and scooted his thrown up a bit. Who ever set his drums up for him must have done it exactly right. We listen as Buddy rehearse the band. He did Norwegian Wood, part of Channel One suite and another I can not recall the name of, all these years later. I was amazed at his playing. He played for about 30 minutes. He came up to the bar and asked for a pitcher of water to be placed next to his set and said he would be back later. I spoke up as he was almost a foot from me. I asked him if he was going to play Channel One Suite that evening as it was a favorite of mine. He said he didn't get too many request for it but said he's be glad to. I told him that I was a local drummer and taught drums at a local studio. I explained to him that I had told all my students about him and they too were buying his albums. You must remember that this is 1973 or so and folks my age and younger didn't listen to Buddy Rich's band on the radio. You had to know who he was and purposely go out and buy his album. Buddy was very cordial. He played two shows that evening and about mid way through the first show Buddy stopped and talked with the audience. He saw me and my friend sitting at a table and smiled. He announced that a young drumming friend sitting at the table by the pole had asked if he would play the next song. He then said, "this ones goes out to Denny and thanks for the support." I will never forget that night! Wow! was the only words I could think of then and they still fit almost 28 years later. Wow! I think he put a little extra in the solo that night as it seemed twice as long as the album. The crowd gave him a standing ovation and I was one of the first to my feet. Over the years, I went and saw him five different times in Houston. Once he accompanied Petula Clark on stage downtown. I don't think he did that much so I was treated to a very rare concert. I saw him live the last time in Houston in early 1980 or 81. He was playing in an off the wall club on Washington Street that I can not even remember the name of. The place normally had local musicians but for some reason had booked Buddy's big band in it. I bought tickets and asked for a place where I could be a close to the drums as was physically possible. I was in a raised setting area behind the band and directly behind Buddy and could look over his shoulder as he played. What a technician he was. He broke a couple of sticks that night. Since I was so close, getting them from the floor was no problem. That night, during the break, I went back stage and got to talk with him for a couple of minutes. He had changed into a robe as he was dripping wet with sweat. I felt a little embarrassed to bother him during the break but he was very cordial. He autographed the sticks and I recalled him playing Channel One Suite for me at the La Bastille Club some eight or nine years before. He didn't recall, I don't think, but said he was glad I came back to see him. After the break he played Channel One Suite. I know he did so because I had mentioned it to him on the break. During the solo I started shouting, "Go Buddy Go" the rest of the crowd took it up and did he ever play. That was the last time I saw him live. So close I could have touched him. I must tell you, he touch my life. Sometimes we cherish the memories we have when we cross paths with greatness. I don't know what Buddy Rich was like in his personal life. I can tell you he was a marvelous showman and I always found him both sincere and friendly when I was able to talk with him the two brief times our lives crossed paths. Recently I bought several Video tapes with Buddy playing on them. All of the memories came flooding back and I thought I would add this recollection to your story collection. I don't think I'll ever forget such a master of the drums. Its hard to believe he is gone. His playing and recordings will be long remembered. My introduction to Buddy Rich, as a drummer, was when I was about 13 years old. I was looking through a record collection of a dairy farmer friend of mine, and came across the Buddy Rich Vs. Max Roach record. My friend said I could have the album. I had absolutely no Idea who Buddy Rick or Max Roach where. I was absolutely floored at what I heard. I listened to that album everyday, and I would try everyday to learn from that album using my Arrows cut in two for drum sticks, on my garbage can with paper clips for a snare drum. My mother wouldn't let me have a drum set at that time, because see wanted me to continue with the Clarinet. I still consider the solos by Buddy and Max on "Yesterdays" to be the best solos ever played. The setting up of tension and release against the nanigo rhythm should studied by every drummer who wants to play Jazz. A couple of years later I saw Buddy Rich and Gene Krupa on the Sammy Davis jr. show. I remember the incident very well because I had made the mistake of saying that I thought Buddy Rich had smoked Gene Krupa, which upset my mother greatly. She went on a long diatribe about respecting the accomplishments of an individual like Gene Krupa and reminded me that I had no business showing disrespect like this to man of Gene Krupa's stature. A lesson we could all stand to learn. I had the opportunity to see Buddy live 3 times. The last two were the most memorable. In 1973 I saw him in Rome, GA. Apparently he had fired the bass player the night before, and had acquired a player from the Atlanta area for this concert. It was obvious that the bass player was lost and didn't have a clue. Despite that the band was great. When they were about to take a break Buddy came to the front and the crowd was giving a long list of requests. Buddy said, "we're not going to play Channel 1 or West Side Story or any of that #%&*. We're going to take 15 minutes and figure out why." About 5 minutes into the intermission we saw the Bass amp being rolled off the stage. Apparently, the bass player was sent packing. The guitar player took over on bass and did a superb job. The band and Buddy sounding even better. The last time I saw Buddy live was in Virginia Beach in 1979. I stood 5 feet from him but did not have the nerve to introduce myself. (At that time I was in the Air Force Band at Langley AFB, VA and was in charge of the 17 piece Jazz Band. Of course, we did a number of Buddy Rich Charts.) I wish I had spoken to him because of the enormous influence he had in my playing. During one of his solos the light man had put a green filter on the spot light, while Buddy was playing a soft roll. You could hear Buddy say, "green,.... greEN.... GREEN". (He, apparently, was not please with the color choice). Upon hearing this, the light man promptly changed the filter with lightning speed. Buddy was one of the few drummers that actually inspired me to play better. He is definitely missed.